Sutton is one of the classiest and most exclusive clubs in Barcelona and this is why it’s important to dress appropriately. Pretty much you need to dress for success. That’s why it’s important to know Sutton’s dress code. The bouncers are Sutton are known as being very strict when it comes to who goes in and who doesn’t and that mostly has to do with how you are dressed. Here is our guide on how to dress appropriately when going to Sutton. This applies to both ladies and gentlemen. You can never look too good for Sutton. Invest in a nice plain button-up shirt or a well-fitting polo with neutral colors. Definitely no tropical Hawaii shirts or Tony Montana-style of shirt. A t-shirt is a definite no-no no matter how sick it looks. If it’s cold outside, go for a cardigan or a chic sweater. As for pants, avoid highly ripped/distressed jeans and opt for classy and dark slacks. Definitely no cargo pants, loose khakis or sirwals. Anything more casual than this (image below) and you may run into issues getting in especially on Thursday, Friday and Saturday nights. We have heard lots of stories about people who weren’t allowed to enter clubs simply because of their shoes. Make sure your shoes are clean, stylish and chic. You want your shoes to look good without catching much attention. 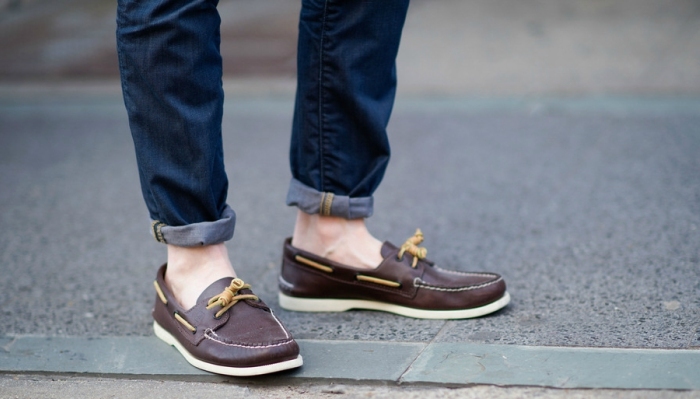 Boat shoes are comfortable to walk in and chic enough to enter a club like Sutton. Make sure your hair is clean, washed and groomed well. Lots of clubs do not allow in girls and boys with rasta hair, mohawk or an undercut. Honestly, we ourselves haven’t heard that someone was rejected entry to Sutton because of their accessories unless you are wearing weird ear rings and piercings. Keep it clean and simple. You can never go wrong with some classic watches with stainless steel or leather straps or a leather wristband. As for jewelry, it’s ok to have a necklace that’s not too revealing but you might run into issues if you are wearing gigantic gold chains around your neck!! A necktie is not a must but it definitely gets you some extra brownie points at with the bouncers. If you have a face/neck tattoo, you will most likely get rejected (unless you are Lil Wayne!!). If your tattoos are revealing (like a sleeve), wear a long-sleeve shirt just to hide them from the bouncers. You think you now have what it takes to enter Sutton? Sign up on our FREE Barceloning guest list here and you will be be able to enter Sutton for free until 2:30am and on Saturdays until 2:00am. It’s much easier for girls to get into a club than guys but the aim should be to look good, not just to get in. If you are a girl, you have a lot more leeway than guys. Aim for something high class and sophisticated. Avoid something too flashy like a hot pink dress or something too revealing. A good looking dress or a skirt is always the safest option. Most girls opt for a dress or a skirt in Sutton but classy and chic slacks can look good with a silk top and a blazer. Avoid highly ripped/distressed jeans. This is similar to what applies to guys as well. You aren’t required to wear high heels but certainly no flip-flops or running shoes. If you want something more casual, go for a pair of ankle-high gladiator sandals or All-Star Converse sneakers. As for your make-up, less is more. You don’t want to overdo it. A touch of foundation, concealer and mascara should do the magic. Girls can get more creative than guys with their hair and they usually have a privilege. Any style is fine but we should warn you about having a rasta hair. Even though the bouncers usually don’t like men with undercuts, women can get away with it. We don’t think there is any limit to this. Keep it clean and classy. We can’t think of a time a girl wasn’t allowed into Sutton simply because of her tattoos unless you have face and neck tattoos. Now that you know how to dress better for Sutton, it’s time for the Barceloning card. You can enter Sutton every night for free until 2:30am and 2:00 on Saturdays just by showing the Barceloning card at the entrance. Click here to find out more information about the Barceloning card.